The TonoRef is an autokeratometer, non-contact tonometer and non-contact pachymeter. A tonometer is used to measure intraocular pressure (IOP), which is the pressure inside your eye. A tonometry test is primarily used to check for glaucoma, which is a serious eye disease that can lead to blindness if not treated properly. 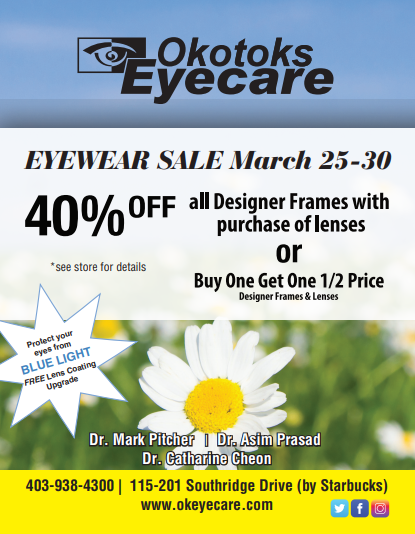 There are several types of tonometers, including a non-contact tonometer that uses air and does not require eye drops. The TonoRef is one such tonometer. This large pupil zone imaging method measures the central refraction and a large area refraction.The difference in the measurement allows assessment of the effect of pupil size on vision under mesopic conditions. Keratometry measurements performed with the mire ring method reduces interference from the eyelids. The TONOREF™ performs measurements at diameters of 3.3 mm and 2.5 mm.Comparison of the two values allows a better understanding of the cornea shape. Automatic Puff Control (APC) – In subsequent measurements, the APC function performs the measurement with the minimum air pressure based on the previous measurement data. The Diopsys NOVA is a non-invasive vision test that diagnoses vision disorders, helps doctors plan treatment, and helps monitor results. It utilizes electrophysiological technology, including Visual Evoked Potential (VEP) and pattern Electroretinography (ERG). Visual Evoked Potential (VEP) measures the electrical response from a visual stimulus. A checkerboard or some other visual stimulus is placed in front of a patient, and electrodes are placed on the persons head to measure the electrical response of the patients’ eyes. The patient is not required to give any verbal response, which makes this test perfect for young children, infants and those with communicative challenges. TearScience produces the LipiFlow® and LipiView® devices for treating Meibomian gland dysfunction (MGD). The LipiView® provides a detailed view of the tear film using interferometry which permits precise measurement of lipid layer thickness down to nanometer levels. The LipiFlow® device provides vectored thermal pulsation to warm the meibomian glands through the inside of the lids and gently massage thickened meibum (lipid) and debris from the gland. This system is cleared by the US FDA for the treatment of MGD and evaporative dry eye. With hundreds of patients successfully treated, LipiFlow® has proven to be safe and effective. The new Humphrey Field Analyzer 3 (HFA3) from ZEISS, is the next generation in visual field testing and analysis. The HFA3 is designed to accelerate clinic flow while delivering the same gold-standard testing strategies and test patterns. Using 32 rings and over 15,000 measurement points, the E300 provides detailed corneal mapping data over a wide area of the human cornea. Coverage extends from a minimum ring diameter of 0.25mm to beyond 10mm, which is ideal for detailed assessment of corneal pathologies and accurate contact lens fitting. The Cirrus HD-OCT is a non-contact, high resolution tomographic and biomicroscopic imaging device. It is indicated for in-vivo viewing, axial cross-sectional, and three-dimensional imaging and measurement of anterior and posterior ocular structures, including cornea, retina, retinal nerve fiber layer, ganglion cell plus inner plexiform layer, macula, and optic nerve head. The Cirrus HD-OCT is intended for use as a diagnostic device to aid in the detection and management of ocular diseases including, but not limited to, macular holes, cystoid macular edema, diabetic retinopathy, age-related macular degeneration, and glaucoma. 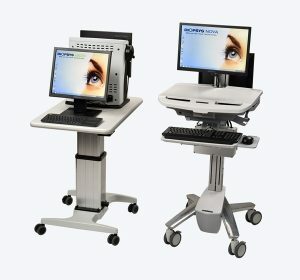 The new Cirrus HD-OCT 5000 system features a modernized system based on a fast Windows 7 computer with much more faster processing and OCT camera system, a larger viewing monitor and a wireless mouse and keyboard. The Cirrus 5000 includes increased speed, more comfort and and a more reliability than any previous model. 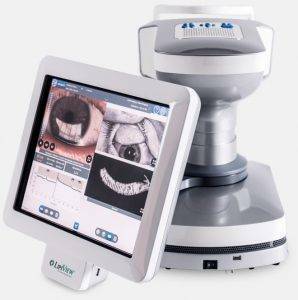 The Cirrus HD-OCT is a non-contact, high resolution tomographic and biomicroscopic imaging device. It is indicated for in-vivo viewing, axial cross-sectional, and three-dimensional imaging and measurement of anterior and posterior ocular structures, including cornea, retina, retinal nerve fiber layer, ganglion cell plus inner plexiform layer, macula, and optic nerve head. 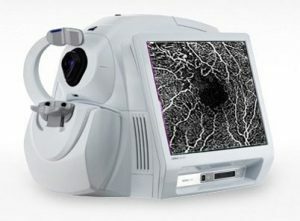 The Cirrus HD-OCT is intended for use as a diagnostic device to aid in the detection and management of ocular diseases including, but not limited to, macular holes, cystoid macular edema, diabetic retinopathy, age-related macular degeneration, and glaucoma.The new Cirrus 5000 system features a modernized system based on a fast Windows 7 computer with much more faster processing and OCT camera system, a larger viewing monitor and a wireless mouse and keyboard. The Cirrus 5000 includes increased speed, more comfort and and a more reliability than any previous model. Star control process: Especially for hydrophobically treated lenses, this cycle offers outstanding control of the lens integrity (centering, edging, treatment resistance), irrespective of the material, shape, and finish. The Visioffice is a 3D measuring system. It measures a person’s head tilt, eye location, shape, and movement, which enable it to determine the best lenses for that patient. It measures the two eyes individually, which allows for the most precise vision possible, no matter where a patient looks through the lens. The VisiOffice helps in giving a patient a precise measurement of their eyes and educates and aides patients on frame selection. The Visioffic makes choosing eyeglasses a completely unique experience. Tear osmolarity has been shown to have the best predictive value for diagnosing Dry Eye Disease of any single test. TearLab’s sophisticated lab on a chip technology tests a tiny tear sample to measure Osmolarity or the salt content in the tears. The Doctor will test both eyes and will take the highest number of the two tests, to generate Your Osmolarity Number. Your Osmolarity Number gives doctors a meaningful measure of the health and stability of the protective tear film that covers the surface of your eyes. The number generated correlates with the severity of the disease. The lack of correlation between clinical signs and symptoms of dry eye disease makes diagnosing and treating patients a challenge. Often times, inflammation is present before the clinical signs of dry eye. InflammaDry is the first and only, rapid result, in-office test that detects elevated levels of MMP-9, an inflammatory marker that is consistently elevated in the tears of patients with dry eye disease. All other dry eye tests measure tear production and stability. Using a simple 4-step process, InflammaDry recognizes elevated levels of MMP-9, to identify patients that may otherwise be missed with other dry eye testing methods. Using direct sampling microfiltration technology, InflammaDry accurately identifies elevated levels of MMP-9 protein in tear fluid samples taken from the inside lining of the lower eyelid, the palpebral conjunctiva. InflammaDry is a disposable, low cost test, that requires no additional equipment to administer or interpret results. Using four simple steps, InflammaDry test results are achieved in just 10 minutes, aiding in the diagnosis of dry eye before the patient leaves the office.